Only Ardie A. Davis and Paul Kirk, the go-to sources on barbecue, can earn the trust and the recipes from the nation's barbecue legends, from Texas to Memphis, the Deep South, Kansas City, Oklahoma, and even a few joints outside of the traditional barbecue belt. 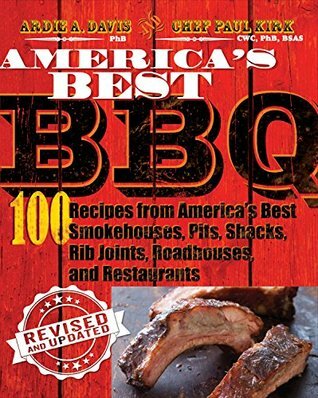 Tasty sides include tips, tricks, techniques, fun memorabilia, 365 full-color photos of the joints and their food, and firsthand recollections of tales from the pits culled from over a century of combined barbecue experience. There is even a section of barbecue basics for those who are just getting started. With more than 100 recipes for mouthwatering starters (Fried Cheese Stick Grits, BBQ Egg Rolls), moist and flavorful meats, both classic and inventive side dishes (BBQ Cornbread, Grilled Potato Salad), a slew of sauces and rubs, and even some decadent desserts (Fried Pies, Root Beer Cake, Pig Candy), this book should come with its own wet-nap. This was a fantastic cook book about BBQ, first the pictures were excellent, but there was a little write up about each place they visited. History of it and the people. The owners of all of the recipes inside of the book shared one of their own and I thought that was very unique since a lot of people don’t like to share recipes. They traveled to the normal places you would think for BBQ Texas, Memphis, Kansas City, Oklahoma, but also in the South and in the West. I will say living in California I still think the BBQ is different once you get to Oklahoma and pass the Mississippi River, at least for me. I will need to go to Texas and try theirs, but back to the back. There are different kind of recipes for you to try like fired pickles, and they have rub and sauce. Each one comes with pictures and instructions if you want to try them yourself. 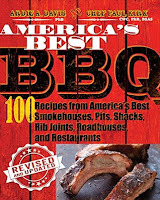 So overall this is a great BBQ or cookbook, but also shows you that if you travel you can meet some very nice people while eating some good food. Igot this book from net galley. I give this 5 stars.